My son lives on the streets of Oakland. Legs painful and swollen, health compromised by Hepatitis C and heart damage, he pushes a cart full of other people’s trash in the darkest hours of the night. 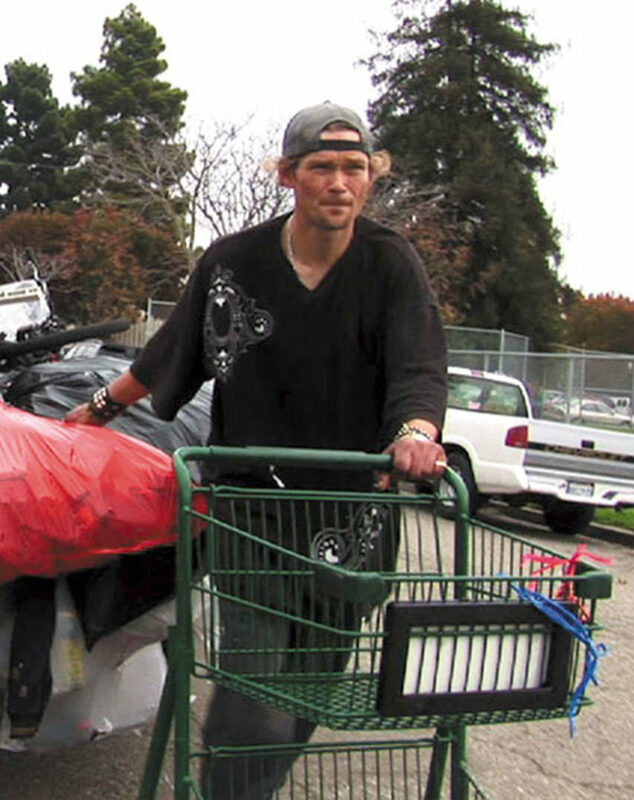 Jason Witt is a homeless recycler in Oakland — and the son of Marjorie Witt. He tows a car-sized load of trash to Alliance Recycling, hoping to earn enough to survive another day. You wake in the middle of the night to the sound of somebody rustling through your garbage can. You get out of bed, peek through the window blinds, and see the disheveled white man, hands blackened, calloused, the size of boxing gloves. You watch as he loads cans into one garbage bag, glass into another, and balances the bags on the sides of his shopping cart. He finds the pizza left over from the party you hosted a week ago and eats it with ravenous appetite. He reaches further down, retrieves your old baggy jeans and puts them on over his layers of clothes. As he walks away, his gait falters and you may think he has the unbalanced shuffle of a drunk. You return to your bed and listen to the fading clamor of glass and metal as the cart rolls on to the next dumpster. The man is my son. He’s 42 years old and has lived on the streets of West Oakland for four years. Legs painful and swollen tight under baggy jeans, he lumbers down the streets in the darkest hours of the night, towing that shopping cart with a car-sized load of other people’s trash. He turns the trash into money at Alliance Recycling, hoping to earn enough to survive another day. At dawn he returns to his home — a lean-to of plywood and tarps behind the freeway, away from the majority of the homeless. He is an outcast even here among his peers. Our son was raised in a middle-class home within a wealthy community. He struggled with the haughtiness of his peers, failed to meet the standards of one of the best school districts in the area, and looked for a way to escape. Not able to change his physical environment, he found a way to change his mental environment. He discovered drugs — on the streets of Lafayette. By the time he was 14, he was in a drug rehab program, followed by years of family therapy. Nothing worked. He dropped out of school, couldn’t hold a job and couldn’t stay out of trouble. Trying to live with addiction ripped the family apart. Tired of drug dealers knocking on the door, middle-of-the-night rampages, and fearing for our safety, we needed to let him move on. For years, we found places for him to stay — mobile homes, apartments, a house in West Oakland, a van, a car. Each time he faced eviction for one reason or another. Our resources have diminished to the point where our help is no longer possible. Our son refuses to stay in a shelter or go to another rehab facility. We can’t force him. 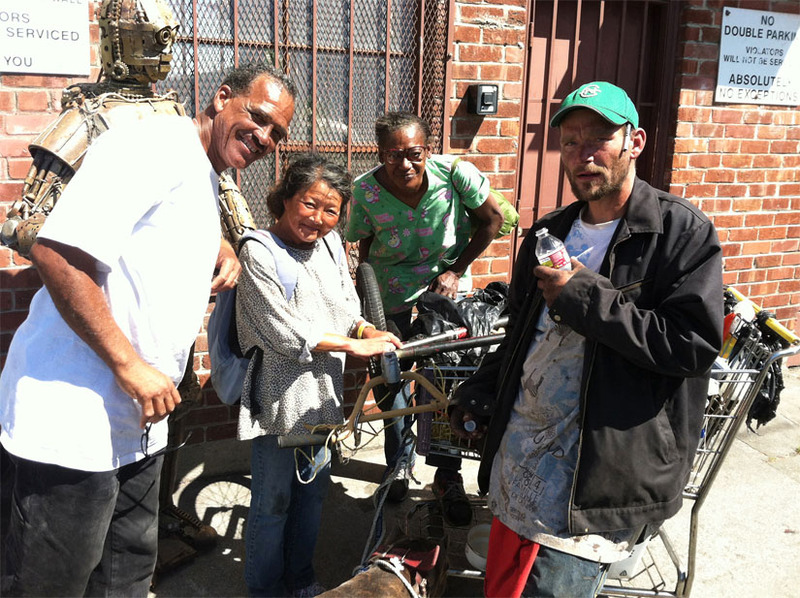 Jason Goodwin (at far right) with his community of friends and fellow recyclers at Alliance Metals in West Oakland. It’s denial of the disease that prevents recovery. His denial is further complicated by a severe head injury sustained when he was hit by a semi-truck. One day he tells us he is content to be living on the streets. The next day he begs to live with us. This is not an option. We cannot live with his hoarded trash, lapses of sobriety and uneven temperament. He cannot live with our ideals, restrictions and rules. I keep my distance, physically and mentally, for my own well-being. My relationship with our son is tenuous, careful and cautious, hinged on years of conflict. I am heartbroken when I see our son. This sad unkempt man is not the happy fastidious child we raised. I have grieved the loss of that child for nearly three decades. His sky-blue eyes are now sunken behind the gaunt mask of his hardened face, his breath reeks the odor of rotten teeth. His immune system is compromised by Hepatitis C and heart valve damage from endocarditis, resulting in frequent hospital visits. These are the most difficult times. Each time he is hospitalized, we visit and we wonder: will this be the last time? When he is well enough by the standards of our government’s policies, he is forced to leave the hospital without a follow-up plan. With nowhere to go but the streets, he struggles until the next time — sometimes days later, sometimes months later. We wait for the next phone call. I watch as my husband’s health declines. He chooses to stay connected with daily trips to Oakland, ensuring our son gets his methadone dose and a hot breakfast, bringing him home to bathe when his body oozes with infection. Too many missed daily appointments at the methadone clinic results in removal from the program. The addict ends up in withdrawal and seeks street drugs to ease the pain, exacerbating the problem. This is not only our story. Every one of those homeless people that you see has a family somewhere. Homelessness, like addiction, affects the entire family. We live with guilt when we sit down at the family table with the empty chair and as we tuck ourselves under warm covers on a cold and stormy night. Holidays and birthdays go by with regrets. What could we have done differently? We know we did the best we could, but the guilt still haunts us. What can you do? Advocate for the poor. Help to keep the recycle centers open. When you see a homeless person, talk to him (or her). Remind them there are people who care. Acknowledge them. Share what you can, even if it is only a smile. Spare change, food, toiletries, even clean socks can be a Godsend. I have a cousin who buys a new jacket before it’s needed and finds a homeless person for his old one. He was homeless once. He knows. Remember—there is no guarantee that you will always have a roof over your head.